The next two weeks are finals week, I have multiple paper to write, along with research assignments.With that being said I will not be posting much, if anything at all. I just don’t need to add that to my list of things to worry about getting done. Let’s see what everyone else gets done in the two weeks that I am gone. 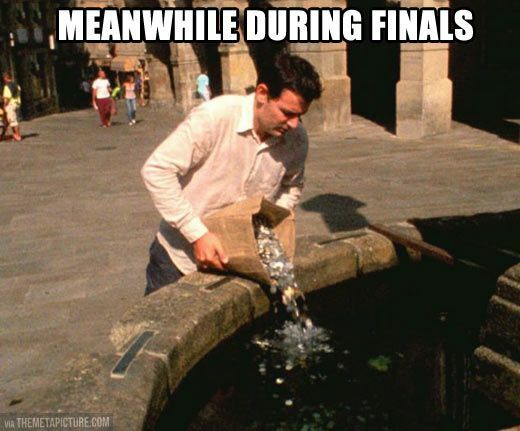 Mean while you can find me by the fountain. So I just recently read a book that took place in 1916, and it got me thinking two things. 1. What happened to knitting clubs? 2. 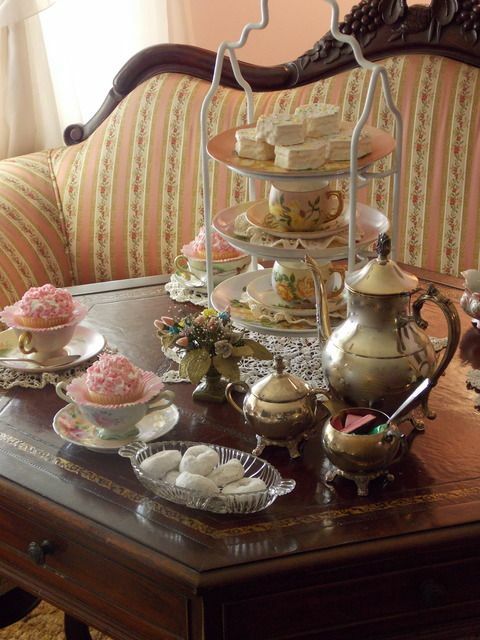 Why don’t women have weekly tea parties? I realize that it is highly unreasonable for women to take time out of their week to get together in person and do something productive. But I am going to propose that we do it anyway, why? Because we are women and we can do anything we put our mind to! With the possible exception of killing big bugs (particularly spiders), and even then we can do it if we have to. My proposal is that we have a weekly get together right here on this very blog. Every week we can come together and talk in the comments, share ideas, drink tea (or whatever you like to drink, for me it’s Coke), and have a wonderful time being women and taking about the things that go on in our house holds. Or whatever it is you like to talk about. If I can make it work I will see about getting one of those live chat forms things, but if not we can just do it in the comments. Our first one will be on Wednesday June 18th from 2pm-4pm. If this is something that sticks around, I will do my best to improve the platform. Maybe we could do one of those Google hang outs or something. I don’t know, thoughts? Ideas? Suggestions? I will be here, will you? Has it Really been Six Months? In some ways it feels like yesterday, and in others, a life time; but no matter how far away it feels I know one thing for certain. I wouldn’t trade a single day of it for anything. This is not to say that we don’t have bad days, because like any other couple we have them. The good ones just over shine them. For our sixth month anniversary we ate at the new Panda Express, and talked for an hour before he had to go to work. It was perfect. Sometimes marriage means giving up the last two chocolate covered donuts, (you were saving for later), because you forgot to go to the store and by more waffles. Moral of the story, don’t forget to get breakfast foods for a man that is working on the night shift. As it would turn out this summer has been rather uneventful. Before summer started I thought that this would be the most busiest summer ever. I thought that I would be moving in to my house, cooking cakes, burning dinner, having friends over, and filled with school work. So far this summer as not been that. Well it has been full of school work. This summer has been filled with Jacob working, waiting on the house to be ready, and waiting for the next big thing to happen. It has been a pretty good summer, moving too fast as always, but good. I thought that I would be blogging a lot more than I have been, but I just can’t seem to get in to it. However I have made a very nice list of things I have done, for your enjoyment of course. It has a title, and a very snazzy one at that! It has the best epilogue in the history of epilogues, and the best Prolog to go with it. Unfortunately my book is missing something rather important. I am in love with the last chapter, the epilogue, the ending, the Prolog, and the first paragraph. Other than that there is nothing else to like. Really, there are no words, period! However, I can already tell you that it will be on the New York Times Bestseller list when it is published. Trust me, I know. The story is great, I know it really well. I can tell it to you by heart. I just can’t write it down, my heart is just not in to it. But that is another blog post. And I am half way through a fourth one. Yes it was good and sad, and yes I cried. Most wives get the “wife chop,” I dye the tips of my hair pink. I can cut them off when I get tired of them. I got them all for $150! They were on sale for $25 each at Home Depot, how could I resist? I needed lighting for our house, and mom wanted one, and the ones we don’t use someone will. It was a great deal, and they will look great in our house. But I did decide to get social this past week, I started talking to people I haven’t talked to since school got out, and made plans to get together with them. This summer has been great so far and it’s not even half way over yet. Have a great summer, I hope it is as eventful as mine!